April 30, 1971 was a day like no others for railroad buffs. May 1 marked date when Amtrak would take over most of the long-distance passenger train service in the United States. Therefore, the last runs for many trains that did not make the cut as a result of Amtrak cutbacks were scheduled for April 30. Railfans had to make some difficult choices on April 30 in both the Bay Area and elsewhere. Which “last run” should we be a passenger on? There was Santa Fe’s “San Francisco Chief,” which would not finish its westbound run in Richmond until May 2. There was Southern Pacific’s “San Joaquin Daylight.” There was the final run of the “Coast Daylight” on the San Francisco Peninsula (it was being switched over to the East Bay the next day). Last but not least, the “Del Monte” from San Francisco to Monterey, which is the choice I made. A cloudy sunset over the Salinas River as Southern Pacific Railroad’s “Del Monte” regular excursion train that ran between San Francisco and Monterey since 1889 takes its penultimate journey to Monterey, crossing the twin steel truss bridges on April 29, 1971. Leading the train are two GP9Rs diesel locomotives, numbered #3002 and decorated in red and black. Photograph by Drew Jacksich. The "Del Monte" left San Francisco’s old station at Third and Townsend as usual at 4:50 pm with a considerably longer consist of the old Harriman suburban cars from the 1920s pulled by a pair of GP9 diesels. I went into a vestibule right away on the west side of the train. I hoped to see the northbound Coast Daylight around Redwood City but was told it had sped by like a bullet while I was on the wrong side of the train. When we reached Watsonville Junction, a woman asked the conductor if he would be assigned to the new Coast Starlight, but he did not respond and expressed bitterness over the end of the Del Monte, saying that it will strand needy passengers who depended on this train for transportation. I ended up standing at the back of the train after this for a short while. While passing through the Elkhorn Slough area, a block signal facing south was struggling unsuccessfully to change colors. A man next to me went off to report this to the conductor. Out on the Monterey branch, the train arrived in the town of Marina. A small automobile sat close to the east side of the tracks with its emergency flashers going. As a result of this, the train stopped and let on a couple of passengers even though Marina was no longer a flag stop. A man joined me in the vestibule and said he wished the train would stop at all of the flag stops to commemorate the last run but we passed Fort Ord and Seaside without stopping. However, a few passengers asked to detrain at Del Monte station. The conductor, who I was standing next to, pulled a cord to signal the engineer to stop the train and we came to a gentle stop. A passenger asked the conductor how long Del Monte had been a flag stop and he said it always had been one. I knew this wasn’t true, that in the days there was a big hotel here, the Del Monte, that the train always stopped for. The conductor did not have access to my old timetables. Del Monte Express outside Monterey Depot, September 1970. Photo by Drew Jacksich. We arrived in Monterey ten minutes late at 8:10 pm. A reporter from the San Francisco Chronicle raced off the train to a phone booth to dictate his story of the last Del Monte. A few passengers begged the conductor to let us ride the "deadhead" back to San Jose, but he refused saying this required permission from Southern Pacific management. So it was onto a long trip on Greyhound. Today the Monterey branch lies disused or dismantled, it’s rusty tracks paved over in various spots invisible to those passing by. 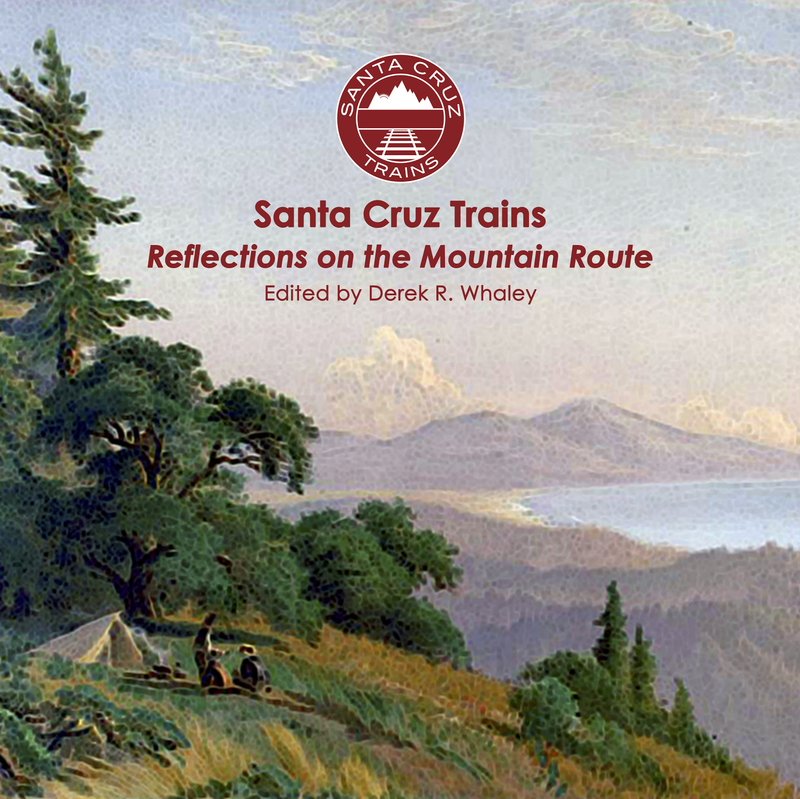 It has been two and a half years since Santa Cruz Trains: Railroads of the Santa Cruz Mountains was released, but, as many followers of my blog and Facebook group know, the “mountains” are only half the story. Since August 2014, I have been living in Christchurch, New Zealand studying for my doctorate in History at the University of Canterbury. Now I am nearly done and am ready to begin something long-awaited and more necessary now than ever before. The history of Santa Cruz railroading may have begun in the mountains, but it achieved great and enduring success along the coast, with a railroad built between Santa Cruz and Pajaro completed in 1876, a short-line railroad into the forests of Aptos Creek completed in 1882, and a route up to Davenport finished in 1906. Indeed, Santa Cruz County has benefited from railroad access since the Southern Pacific Railroad first built its line to Pajaro in 1872, and the history of the stops along those routes have only been touched upon by historians. 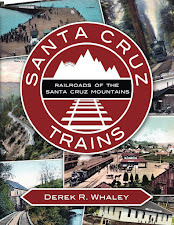 All of this will be discussed in my forthcoming book: Santa Cruz Trains: Railroads of the Santa Cruz Coast. This new book will explore everything from the Sargent Ranch south of Gilroy to the Logan Quarry near Aromas, the agricultural producers in Pajaro and Watsonville to the lumbering operations up Aptos and Valencia Creeks, and from the beach resorts at Capitola, Seabright, and Santa Cruz to the Davenport cement plant. It will be a comprehensive guide to how the railroad promoted industry, business, and community, and how, in turn, all of those entities supported the railroad. In addition to a new book, my original book—Railroads of the Santa Cruz Mountains—will receive an update that will bring it more consistent stylistically and topically with the new book and correct errors and add new information discovered since the book’s initial publication. Both are expected to be released fourth quarter 2018 or first quarter 2019. For the next five months, I will be in Santa Cruz County researching at local repositories, surveying portions of the former and existing tracks, and talking with prominent local historians. Subscribe to the Santa Cruz Trains Facebook Group for more information as it becomes available. 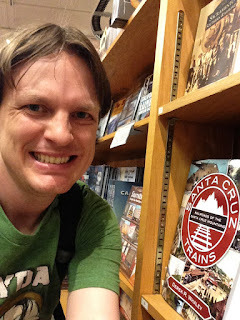 If you would like to provide information for my research, donate photographs or postcards for my book, discuss local history, or join me on a hike, please contact me at author@santacruztrains.com. Roaring Camp Railroads will be hosting Thomas the Tank Engine™ and his friend Percy for the first Thomas and Percy’s Halloween Party this October. Tickets includes a train ride with Thomas the Tank Engine™ and Percy, as well as a variety of Thomas & Friends-themed entertainment, such as storytelling and video viewing, temporary tattoos from the Island of Sodor, an imagination station with arts and crafts, and a pumpkin patch. Guests will have the opportunity to meet Sir Topham Hatt, the controller of the railway on Sodor. Advance tickets are recommended and already available online at http://www.ticketweb.com/search?q=Roaring+Camp. Tickets cost $24.00 per rider. Santa Cruz Mountain Brewing Company has released a special Rail Trail IPA to help fund nonprofit groups that support the retention of the Santa Cruz Branch Line as a rail corridor, while fast-tracking the construction of the adjacent rail trail. Twenty-five percent of all proceeds will go to the Land Trust of Santa Cruz County to support this project. The beverage is available at numerous locations throughout the county, including Surf City Grill at the Boardwalk, Hampton Inn, and Santa Cruz Mountain Brewing Company’s restaurant. At the June 1 meeting of the Santa Cruz County Regional Transportation Commission (RTC), funds were approved to remove trees that fell during the winter storms last February and March. 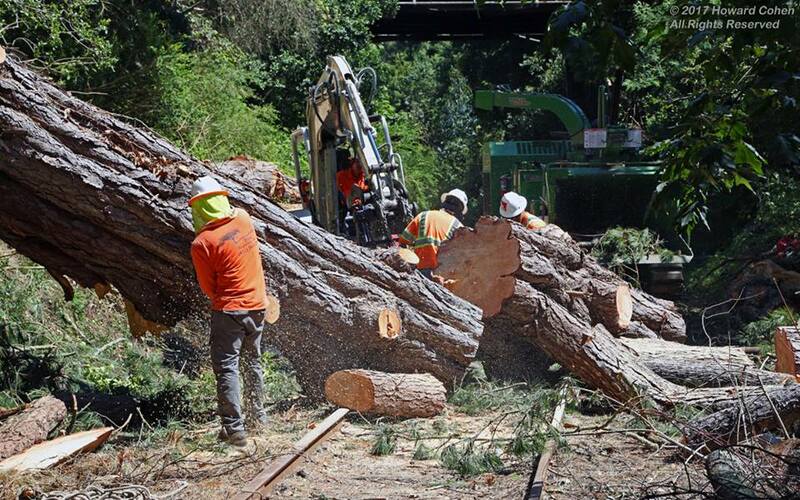 Tree removal along the Santa Cruz Branch Line near Capitola Depot, June 2017. Photograph by Howard Cohen. Removal of trees began almost immediately, running throughout June as documented in photographs on Facebook by James Long and Howard Cohen. During the felling, portions of the old Capitola siding were uncovered, as well as other artifacts of the early railroad era in Santa Cruz County. A section of track was also damaged during the felling and will need to be repaired before service can return to the line. Ian Applegate from Roaring Camp Railroads has revealed two incidents of vandalism in recent months. Ian Applegate’s vandalized railcar at Roaring Camp, June 2017. Meanwhile, on the night of July 12, somebody smashed the safety windows of Applegate’s own M-9 Fairmont Speeder, which is usually parked in the Roaring Camp yard near the old Felton Depot. Applegate began a GoFundMe campaign to restore the historic Southern Pacific speeder to operating condition, which can be found here: https://www.gofundme.com/donations-to-help-replace-windows. The past three months have seen an increase in anti-rail rhetoric from local community activist groups such as Trail Now and Santa Cruz County Greenway. Proposals to replace the Santa Cruz Branch Line with a rail trail have been a constant feature since the line was purchased by Santa Cruz County in 2012, but the passage of Measure D in the past election has brought the topic to the forefront of local politics again. At the June 1 meeting of the Santa Cruz County Regional Transportation Commission (RTC), Brian Peoples of Trail Now spoke on numerous occasions, advocated urgency in converting the route to a hike and bike trail, without responding to frequent concerns by others that the right-of-way may not remain with the county if the rails are removed or that funds used to purchase the right-of-way may not be used to build a rail trail. People advocates for an expansion of Highway 1 to relieve congestion, ignoring the potential for rail service to reduce traffic between Watsonville and Santa Cruz during rush hour. Numerous local community members wrote to the RTC to support rail service and the development of a local and Bay Area commuter service along the line. One local, Gail McNulty, spoke at the meeting, questioning the ability of Highway 1 expansions and local buses to relieve congestion on county roads. Paula Bartholomew also questioned the increased pollution and congestion caused by widening Highway 1. The Land Trust of Santa Cruz County has produced a response to recent misinformation about their stance regarding the preservation of the rail trail. Continuous – Once again, Trevor Park has illuminated mountain railroading through a number of videos created for his Treefrogflag Productions company. Meanwhile, Nick Wolters and Howard Cohen have kept users updated with a number of photographs of local railroad operations in Santa Cruz and Watsonville. Jun. 2 – Ian Applegate advertised a railcar speeder run happening at Roaring Camp the following weekend. Meanwhile, William Turner shared some photographs of damage caused by the winter storms to the old right-of-way and current branch line. Karl Rowley posted a photo of anti-rail advocates gathering on the rail line, prompting a brief discussion about trespassing on active rail routes. Jun. 4 – Van Niven shared a photograph of a the Sells-Floto Circus coming to Santa Cruz around 1910. Bill Dawkins (via Julia Sauer) shared a newspaper clipping from 1884 documenting the establishment of the Loma Prieta Railroad near Aptos. Jun. 5 – Len Klempnauer shared a video of the Amtrak Suntan Special doing a test run in 1996. Jun. 9 – Nick Wolters shared a photograph of trees still down on the tracks near New Brighton. Dale Phelps, meanwhile, shared an H.D. Gremke photograph that of Camp Teller, prompting a short discussion about the camp’s relationship with Santa Cruz County. Jun. 13 – Turner shared a photograph of a massive washout on Shulties Road near Laurel. Jun. 15 – Dawkins shared a link to the Public Libraries’ article on the Portland Cement Co. railroad. Jun. 16 – Joe Thompson shared an advertisement for the Ocean Shore Railroad from 1908. Cohen shared a photo of a trolley run from 2016. Meanwhile, Thomas Rivette lamented the loss of interest in restoring rail service following the Golden Gate Railroad Museum’s decision to move to the North Bay. Jun. 21 – Dawkins shared a pre-railroad story about Waddell Beach in 1849 as well as copy of the land grant authorization for the Ocean Shore Railroad from 1906. Jun. 22 – Joshua Dyck asked for help identifying a large sluice hopper that was being shipped on Highway 1. August Mohr asked for help regarding local model railroad groups. James Long posted some photos of old metal pieces in the New Brighton area, prompting a discussion about narrow gauge material. Jun. 24 – Travis Malek informed everybody of a new local beer called Rail Trail IPA that supports the save the rail, build the trail movement. Janie Soito shared a photo of swimmers along the San Lorenzo River near the Boardwalk, c. 1876. Jun. 26 – Scott Peronto posted a souvenir ticket from the closure of the Los Gatos Branch in 1959. Meanwhile, Sangye Hawke asked a question about railroad service to Evergreen Cemetery in 1892. Jul. 1 – Peronto shared a digitalized Ferroequinologist bulletin from 2007 documenting the end of rail service to Los Gatos. Jul. 3 – Malek shared a news story about a collision between the Beach Train and a car on Chestnut Street. Jul. 10 – Rory Christy shared photographs of Southern Pacific diesel trains on the Santa Cruz Beach, c. 1967. Jul. 11 – Brian Bergtold shared a news story about Iowa Pacific’s troubles running its trains in Santa Cruz County. This prompted Cohen to write a short essay encouraging people to write to the RTC. Jul. 14 – Long shared his discovery of a mile marker near Seabright Avenue that fell off a hillside. Jul. 16 – Christopher Payne shared two videos taken in 1983 near Manresa of kids interacting with an SP freight train. 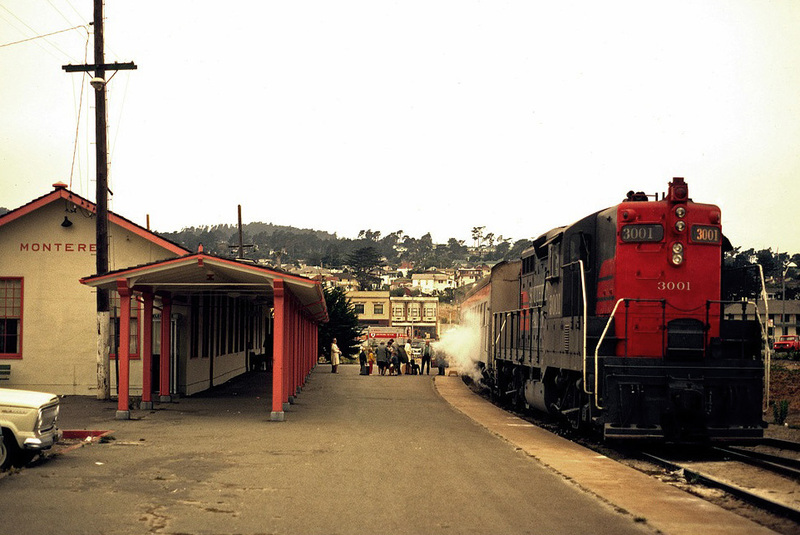 Derek Whaley shared an article on plans to return passenger service to Monterey in the mid-1990s. Jul. 21 – Julia Sauer shared an article on the abandoned town of Drawbridge in the South San Francisco Bay. Jul. 24 – Paul Pritchard shared a photo of the Santa Cruz Beach in 1889, as taken from the Sea Beach Hotel. Jul. 30 – Cohen shared the new brochure for the Golden Gate Railroad Museum, lamenting the county’s loss. Aug. 1 – Bergtold shared a photograph of a Union Pacific train in front of the Boardwalk Casino. Aug. 3 – Wolters shared a video of a Roaring Camp diesel and steam locomotive operating in 1987. Aug. 26 – Soito shared a photograph of Los Gatos Depot taken around 1900. Aug. 28 – Applegate shared photographs of a Southern Pacific-themed birthday cake. Aug. 30 – Cohen announces the closure of the Capitola railroad bridge for the Begonia Festival this year. Ride the trains and dance while enjoying live music! Join for a special showing of Moana! Ride Thomas the Tank Engine™ and Percy!